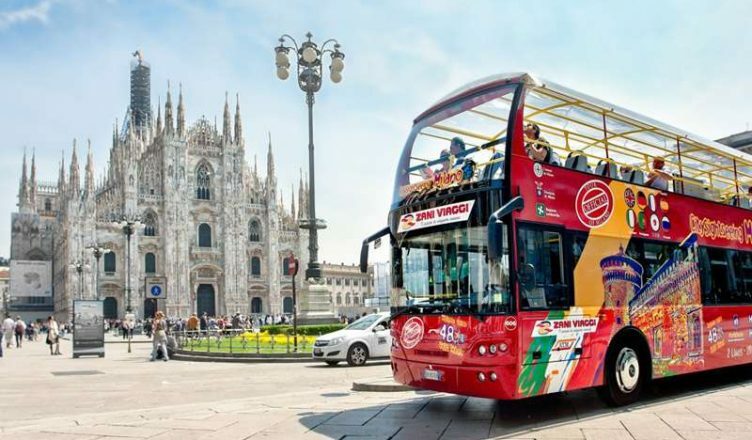 Make a sightseeing city tour of Milan with Hop on Hop off bus, you will have the opportunity to visit Milan by going on a red open bus and descending to the stops of your interest for 24h or 48h. Included in the ticket you will have an audio guide in English, German, Spanish, French, Portuguese, Russian, Chinese or Japanese. 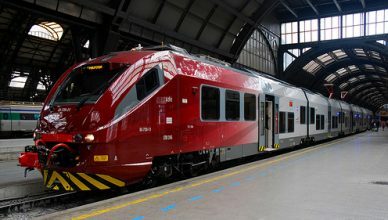 Below you will find information on one of the three lines of the Milan tour with Hop On Hop off, Line A.
SFORZA CASTLE – Before going on Open Bus Tour of Milan with Hop on Hop off, visit the Sforza Castle. Built in the 15th century by Francesco Sfora, it is one of the symbols of Milan. The central tower of the Castello Sforzesco, called the Filarete tower, is a reconstruction of the architect Luca Beltrami. The tower was destroyed in the 16th century. The base reconstruction on depictions found in a Madonna with Child painting of the Leonard school, now preserved in the castle’s collection. Thanks to the MilanoCard, the tourist City Pass of Milan, you can visit Sforza Castle and Milan Civic Museums for only 10€. Click here to find out how. LEONARDO DA VINCI LAST SUPPER – After leaving the Sforzesco Castle, climb on the City Sightseeing Bus and get off at the third stop in Corso Magenta. Here you will find the Church of Santa Maria delle Grazie. 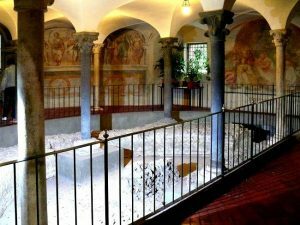 Next to the church, in the refectory there is the famous fresco of the Last Supper of Leonardo da Vinci. The fresco is based on the Gospel of John 13:21, where Jesus announces to his disciples that he will be betrayed by one of them. Leonardo da Vinci studied the motions of the soul of the characters represented, the surprise and the disdain of what they had just learned. Book a visit to the Last Supper thanks to the MilanoCard + Last Supper promotion. Click here. SANT’EUSATORGIO AND TICINESE DISTRICT After visiting the Last Supper, go on tour of Milan with Hop on Hop off until you reach the Basilica of Sant’Eustorgio. The Basilica was founded in the 4th century AD. The legend tells that the chariot with which Sant’Eustorgio was carrying the relics of the Magi from Constantinople stopped without reason, no one could move the chariot anymore. Then Eustorgio decided to build a new basilica outside the city walls, where he then deposited the relics. With Milan City Pass, you can get a 33% discount on the entrance to the Basilica of Sant’Eustorgio and the Milan Diocesan Museum. Click here for more information. DUOMO MILANO – Departing with Hop on Hop off, reach Duomo Square. To the right of the square is the Museum of Novecento, a permanent exhibition of works of art from the twentieth century. Inside there are about four hundred works. The works revere the avant-garde of the twentieth century. 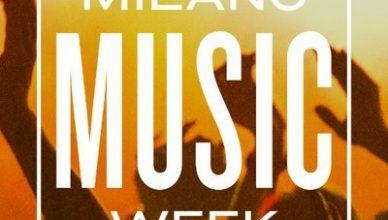 With the same promotion you got for the Castello Sforzesco, you can also join the Milan Museum of Novecento. Click here. POLDI PEZZOLI AND SCALA THEATRE MILAN – As a last stop, get off at the tenth stop of the tour of Milan with Hop on Hop off Bus. Here you can visit the Poldi Pezzoli Museum, a museum that collects works of art donated by Gian Giacomo Poldi Pezzoli. It is one of the most important Italian art collections. The Poldi Pezzoli Museum is part of the “Case Museo di Milano” (Houses Museum of Milan) circuit. Among the works he conserves are those of Perugino, Piero della Francesca, Pollaiolo, Giovanni Bellini, Mantegna, Francesco Hayez and many others. Thanks to MilanoCard, you can get 33% discount or free access to the museum. Click here to find out how. Close to Poldi Pezzoli Museum is located the Scala Theatre and its magnificent museum open every day, where are hosted some of the best memorabilia of the artist and the history of la Scala Theatre. Save 33% with MilanoCard for your visit at the Scala Theatre Museum. Click here for more information about. 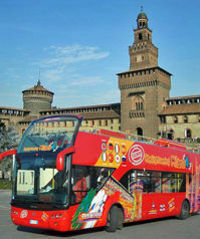 Save 10% on your City Sightseeing Tour of Milan thanks to the MilanoCard the tourist and travel card of Milan . 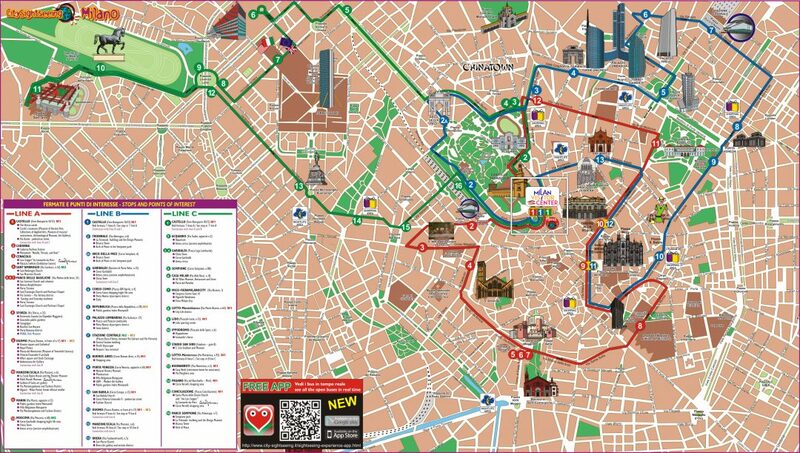 Available for 24h, 48h or 72h MilanoCard offers free unlimited access to Milan Public Transport, free or discounted entrance to the most relevant attractions of Milan, one ride for free with personal driver and also 10% off on your Open Bus Tour by City Sightseeing Milano. Buy now the city pass and save money and time !